Cathedral of the Sacred Heart and St. Casimir Parish: New Adult Bible Study Coming in February! Walking Toward Eternity. Daring to Walk the Walk. Is it time for a change? 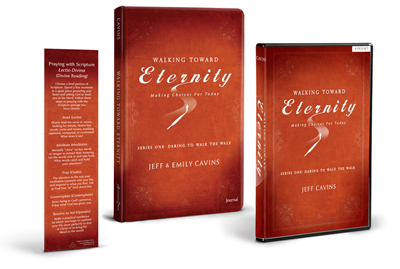 Walking Toward Eternity is an inspiring series designed to help you live your faith more fully by developing and nurturing characteristics that are essential to the Christian life. Through daily prayer and meditation with Scripture, you will be drawn into an intimate and life-changing encounter with Christ. As you prayerfully reflect on God’s Word, you will begin to hear the subtle ways God is speaking to you, and you will be challenged to set aside those things in your life that keep you from growing closer to him. By putting the fruits of your study into practice, you will be able to make real changes in your life, changes that will make you more like the person God created you to be. Daring to Walk the Walk, the first series of Walking Toward Eternity, introduces seven key virtues and outlines practical steps for living them out in your life. "Walking Toward Eternity" will start February 3/4 and run through March 24/25. The cost of the Study Kit is $15. Registration is due by January 19th and checks should be made out to St. Mary's Parish. For more information, or to sign up online, please visit the Psalms page under the Bible Studies & Book Retreats section of our "Adult"page.